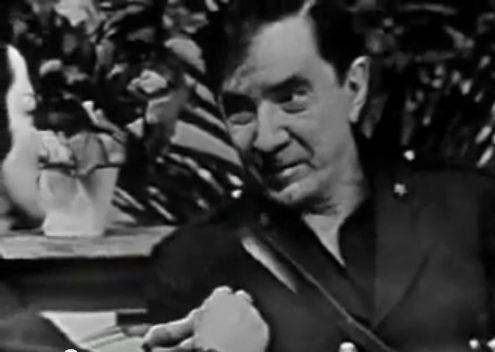 Bela Lugosi’s performance in his first dramatic TV role drew poor reviews. Jerry Franken of The Billboard was particularly scathing, claiming that Bela was “the show’s greatest weakness for he failed to bestow an iota of reality on what appears to have been a fine and meaty part.” The poor critical reception could explain why Suspense remained Bela’s only appearance in a dramatic role on TV. View the complete show below. Reviewed Tuesday (11), 9:30 – 10 p.m. Sponsored by Electric Auto-Lite thru Newell-Emmett via the Columbia Broadcasting System, New York. Producer-Director, Robert Stevens. Announcer, Rex Marshall. Music, Hank Sylvem. Cast: Bela Lugosi, Romney Brent. Back at the stand and doing business in its customarily effective way is Suspense, which last season, and now again this season, gives every indication of being the tops in its throat clutching field. It is still characterized by good story material expertly adapted for tele, facile production and expect in one instance on the show caught good performances. The story Tuesday (11) was the Poe classic, A Cask of Amontillado, modernized in that the locale was occupied Italy and the victim who winds up sealed in the subterranean wall was an Italian Fascist general. This was the role played by Bela Lugosi and the show’s greatest weakness for he failed to bestow an iota of reality on what appears to have been a fine and meaty part. The entire story points to that moment when the general is forced to place his wrists in chains suspended from a wall while the count prepares to turn mason. Lugosi almost seemed to walk into the spot with alacrity, and the tension which had been established in the chase down to the cellar was vitiated. What may have added to the ineffectual quality of Lugosi’s job was the commanding and immaculate performance turned in by Romney Brent, the sort of work which delivers much satisfaction in observing the work of a master craftsman. Only two directional shortcomings marked the program – one the overuse of a circular stairway set to denote the climb into the wine cellars, the other an unscheduled shot of Brent’s head as he prepared to go down stairs “after” Lugosi. Otherwise, the show was grade “A,” all the way. Rex Marshall does the Auto-lite commercials in a straightforward manner, providing the vocals for the animated parade of automotive products.